Even after pain has been relieved and function has been restored, a smile damaged by injury or disease can cause self-consciousness and a drop in self-esteem. How our teeth look is almost as important as how they feel. 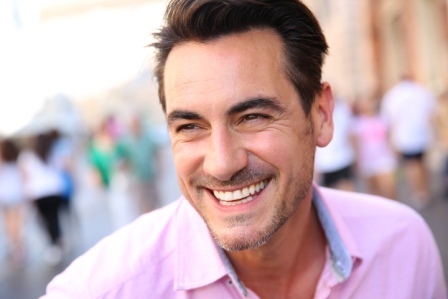 For those who have lost one or more teeth, Advanced Dentistry of Scarsdale offers treatments to make your smile once again look natural, healthy, and whole. When you are missing even one tooth, your entire smile is compromised. Not only does the gap draw the eye, but it can lead to the loss of other teeth due to their tendency to shift into the gap as well as the bone’s natural deterioration after tooth loss. The best way to protect your teeth, as well as to restore the appearance of your smile, is to fill the gap. Bridges are one option for replacing missing teeth. Also called partial dentures, bridges replace a tooth or group of adjacent teeth after they have been lost for any reason. Bridges rely on the healthy teeth on either side of the gap to anchor them. They can be affixed temporarily or permanently, depending on your needs. It is also possible to secure a bridge to one or more dental implants. As dental technology advances, our ability to replicate and restore the natural structure of your teeth continues to grow. Dental implants are the result of many years of progress in dentistry. They allow us to replace individual teeth with sturdy, permanent prosthetics, or to provide a more solid foundation for full and partial dentures. The post of the implant is integrated into your jaw in a similar way to your natural tooth roots, and can help preserve the bone as well as filling out your smile. No matter how badly damaged your smile is, Advanced Dentistry of Scarsdale can help you improve your dental health and beautify your grin. Even if you have suffered extensive injury or decay, we will work with you to create an individualized treatment plan and bring your whole smile back to its natural radiance. Whether you have a new gap in your teeth, or have lived for years with empty gums, Advanced Dentistry of Scarsdale is ready to help you replace your missing teeth. Contact us by phone or online today to schedule your consultation, and let us restore your smile to its natural beauty!